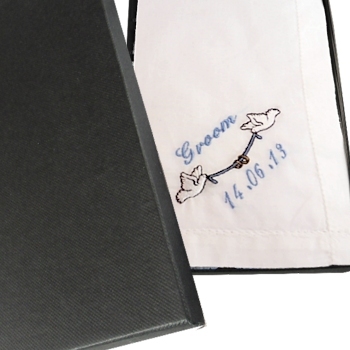 Wedding Doves embroidered single personalised white handkerchief. Wedding Doves embroidered single personalised white handkerchief. The handkerchief can be embroidered with a title, name or date of your choice. You can choose to have a mens or a ladies handkerchief personalised with initials, a name or a brief little message. Just fill in the option box and choose what colour embroidery thread you would like us to use for the wording. We offer a mens cotton hemstitch hanky (as shown on picture) that measures 40cm x 40cm (16 inch) all cotton with 1/4 inch wide hemstitched edges. OR if you require a ladies handkerchief we use a white cotton hanky with floral lace trim around the edges and it measures 25cm x 25cm. Handkerchief comes in gift presentation box. Please allow at least 48 hours for personalised orders to be dispatched as they are made to order by Amys Gifts.